Episode 12 show notes finally!! Another one a week later than planned, but due to visitations…. First from my sister and the children and then from my parents!! So limited crafting time was had in the first couple of weeks! Swatching for some new patterns, these still need blocking out and then finishing off into full patterns…. So these you saw last time…. Then some new swatches are…. These are knit from River Knits Silbermond which is a BFL silk Cashmere base and is STUNNING!!! so we have a swatch of a star pattern and a swatch for some moon phases…. These will also be a shawl soon!! I’ve managed a few more rows on my Hazels shawl pattern which I’m currently working on for a pattern release after the baby is born….. But I’ve left the shawl in my knitting basket downstairs!! I have a HO, one sock for my fathers birthday present…. Plain top down vanilla sock knit out of Weavers Loft sock yarn which is 75% super wash wool and 25% nylon, so good and hard wearing for much use for my Dad! I have also managed to knit up a nearly finished object!! A baby hat for newbie when he arrives… Knit out of rainbow heirloom solo light, which is a single ply yarn that is so soft. Mum bought this for me when she and Dad were last in Edinburgh at Ginger Twist studios. A little more progress on the sheep breed blanket to show…. Most of the Masham barring the cream is now in the blanket, but I’m trying to separate the colours a little so the cream Masham has to wait for the Icelandic to be finished…. So I have spun the bobbin of Icelandic singles finally…. Not as enjoyable a spin as some yarns for me, found it kept slipping through my fingers too fast and needed a much shorter draw…. So I had to spin much slower, but even then I think it might not turn into the most balanced yarn…. I just know it’s going to be squirly!! I need to Navajo ply that, but it’s resting for now…. While I spin up Some Sara’s texture crafts exmoor BFL in the most fabulous underwater colours!! Sara has stopped dyeing yarns and fibres now though and it’s my last roving of her I have to spin now….. So Mum went to Unravel in Farnham and picked me up 2 skeins of Becci from RiverKnits’ splendiferous base yarn in Silbermond. She got there early…. And must have raced to the post office because they arrived the next day by 1pm all the way here in West Wales!!! I have put an order for some fabric I need in… For a commission sew and for some of my own makes…. but given the weather and the fact that no one has been up or down our lane much this week it’s probably sat happily at the post office!! But before the weather turned my ribbing fabric turned up…. I ordered three colours pink, grey and green to see which one I liked best for going with my foxy fabric for my Linden sweatshirt…. And the 5m of black fleece fabric arrived too…. Now I wait on the rest!!! I have also bought two new patterns…. 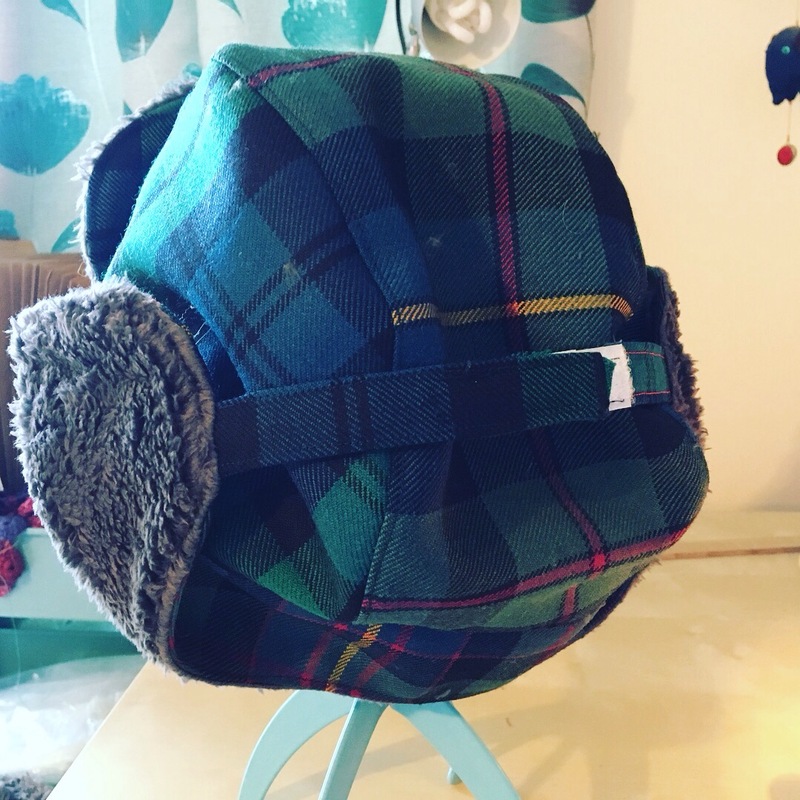 Both are from Made by Jacks Mum, who has a website if you google that name, or an Etsy shop, through which I purchased the patterns… But it’s the same person who created the AJ Aviator hat pattern that I have made for James and now Will. One pattern is the “Free Range Fun over trousers” which goes from 6 months to 12 years on sizings!!! And gives lots of options for light weight waterproof trousers or fleece lined waterproofs and the pattern is for dungarees style like salopettes or trousers. The other Pattern is the Hot Coffee top and dress pattern, which is a sweatshirt pattern or dress sweatshirt, with three options on necklines round, hoodie or funnel and is for men and women…. So these two patterns are for the black fleece and maybe the pink elephant fleece I have in my deep stash…..
And have some finished objects to show off!! Then I have made my Agnes top…. Again in the Stoffstil foxy sweatshirt fabric and I chose the green ribbing from the choice of three for the neck, cuffs and hem bands. Weaving has seen no love again for a while…. I need to sort a table for the loom to exclusively sit on…. Half the problem is clearing my craft table for and clamping it down each time…. And I have had a another bash at the apple pie I made before so I might be ready to blog a few recipes now!! So we have had exciting busy times…. snow….. Ice…..
We have made bird boxes with the niece and nephew…. Built a retaining wall for the polytunnel…. Meshed and started planting the fruit cage…. Built a bit more polytunnel…. Cardboarded our onion/shallot/garlic growing area…. Acquired some more large tubs for spud growing…. Had a delivery of firewood…. Tidied up the front garden…. Planned and sorted our seeds we have into months for planting etc…. Acquired a rather manky looking sheep which is in our field having escaped from a neighbours land, still awaiting the chap who owns the sheep to come confirm its his and claim it!! But they are already quite feisty and jostling about in their hatchery!! Did I mention the snow and the ice….. Well that’s had me confined to barracks as James doesn’t want me to fall and go into the labour, particularly whilst the road was basically impassable!! But it’s caused a Wee bit of barn and roof damage, so yesterday found James out on the roof of the house (only 2 foot from the bedroom Velux thankfully) fixing the log burner flashings and surrounding tiles…. Any way think that’s about all…. You can find me as Tyddyn Bryn on Rav, Instagram, Twitter and there’s a FB group and a Rav group for any chattering…. And I hope to see you all soon…. Like two weeks this time… Not three… But we will see as Baby is due now in 2 and a half weeks!!!! Eek!!!!! Only a week later than planned due to illness, starting with toddle chops and ending in all of us! Swatching for some new designs…..
1 shawl…. In Owl About Yarn Tibetan Owl…. Another shawl which is being swatched in my smooshie base (azure) but will eventually be knit up in RiverKnits’ glorious Splendiferous base in Silberman Mond or silver moon…. One for James and one for Dad…. I’ve balled up the masham and mystery hand spuns and have decided to crochet a log cabin style blanket out of them…. Mainly for ease and the fact it grows sooooo quickly!! Aside… I love the way these Masham skeins have balled up!! Four colours of Sherpa fleece…. And I’m still waiting on some pretty pink cottons and some ribbing fabrics I ordered…. So it’s been three weeks and I have just about three projects finished…. The first two are the Bucket hats by Oliver and S which I have made out this tractor fabric…. One is for William, the other for a little friend of his!! The second is an AJ Aviator hat by Made by Jacks Mum…. This one is for James and I have started the one for William today!! I have been finding crawling about on the floor increasingly not fun for cutting out so I have now spent a chunk of time and cut out a few big sewing projects, smaller one I can manage at my table…. A load of the AJ aviator hats…. Plus I still have a fleece jumper cut out to sew, though I don’t think it will now fit toddle chops, it will have to wait for his little brother to grow into it!! I’ve managed a fair amount of spinning these past few weeks despite illnesses…. All working on this Pomegranate colourway from John Arbon, which I picked up from Wonderwool a few years back now!! I have Navajo or chain plied it and I am definitely finding that easier the more I practice!!! But Amy Beth of the Fat Squirrel speaks has alerted me to another ply variety called thread plying so I think I may try that on next on the gorgeous purples I have also from John Arbon…. And thread ply it with one of the beautiful cones of yarn I was gifted an age ago!!! That way I’d get a really great yardage from it…. Who know maybe even sweater yardage?!?! Or part of a sweater!!! Well last Friday saw the release of the Lovehearts hat!!!! It’s available so far in my Etsy shop and in my Ravelry Pattern store!!! So head on over and have a snoop if you’d like!!! I’m planning to release the next one…. broadleaf around the time I next Podcast…. I am also putting a call out for test knitters for the coniferous hat…. All the details will be in the Ravelry group!! So these past two weeks we’ve been a bit more kitchen productive again after a small hiatus post Christmas!!! I tried to make a apple pie I saw a video for in Facebook, watched once and then couldn’t find again….. It actually turned out great!!!! I’ll make a few tweaks and make it again…. Then blog what I did! And then I made banana loaf cakes!!!! As toddle chops went off bananas when he was ill, loads went really ripe and almost over…. So I went on the interwebs and BBC good food gave me a fab recipe for banana loaf cakes. On the same day as we had the oven all fired up through the day rather than just ticking over James made a vat of spag Bol, a pot of leek and potato soup (his go to Delia Recipe!) and a lasagne for tea!! Yum!! Well there has been snow…. So we’ve done a fair bit indoors, finishing off bits of the house, glossing door returns…. Glossing the under stairs cupboarding…. James has built housing for his electric fencing gubbins…. And he has been collecting wood like no tomorrow!! Phew!!! We have had another growth scan on baby two… And I’ve started washing all the clothes to freshen them up….. Next is the car seat and the baby seats and we built the cot at the weekend!! The winners of the Alpaca are…..
Anita from Gaga knits on YouTube!! Please PM/DM/ message me your postal addresses and I will get the yarn parcelled up and off to the post office the next opportunity I have!!! !